Glaciers form when the snow accumulating on land from one winter does not melt before the next winter's snow arrives. This causes a layering of each year's snow on top of all the previous years' snow. Over many years, this layering can build up to great depths (about 2 miles deep at the South Pole). 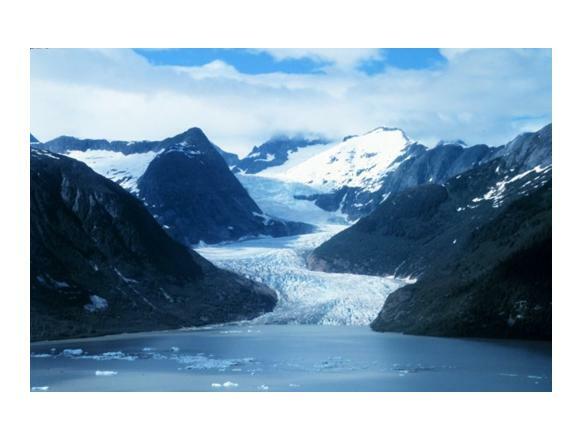 The Earth's largest ice sheets, the Greenland and Antarctic ice sheets, are glaciers. In contrast, though, most of the Earth's glaciers are small, some covering less than a square mile. Because of the influence of the Earth's gravity, large glaciers flow slowly downhill, like a giant river of cold molasses. If they reach the ocean, chunks will occasionally break off (calve) and fall into the ocean. These pieces then become 'icebergs'. Some icebergs from the Antarctic ice cap are huge - as large as the state of Rhode Island. The rate at which the glacier flows downhill is controlled by many things: how much snow adds to the glacier each winter, the slope of the land, the kind of rock that the glacier flows over, etc. It is not unusual for glaciers to "surge", with rapid movement in some years. Most of the world's glaciers that are monitored have receded in the last century or more, presumably in response to a slow warming of the climate system. The extent to which this warming is anthropogenic (human-caused) versus natural is the subject of much debate. The fact that glaciers have receded before, though, is evidenced by currently receding glaciers revealing old tree stumps, in both Western Canada and in Europe. A GLACIER ON THE EQUATOR? As unliky as it might seem, in the hot tropical African country of Tanzania, there is a glacier at the top of Mount Kilimanjaro. The air is cold enough at the altitude of this peak (over 19,000 feet) so that precipitation often falls as snow, and helps maintain the glacier. You can learn more about the Kilimanjaro glacier here. While the Kilimanjaro glacier has also been receding, recent research suggests that this has been due to changing precipitation patterns and deforestation, rathrt than to global warming.